A little while ago I got to spend a few days with my critique partners the Scribe Sisters while they attended the PNWA conference. 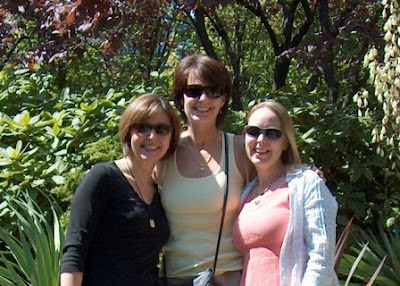 We had a great time catching up and I got to see a bit of Seattle Washington. That's me on the right with Karlene Petitt in the middle and Linda Gray on the left. The fourth Scribe Sister, Jule Rowland, hadn't arrived yet when we took this picture. I didn't attend the conference because I didn't have time to stay for most of it but they did take me as a guest to the opening note dessert where I got to hear bestselling author Andre Dubus. Though I didn't agree with everything he said about writing he was a very dynamic speaker and I liked him so much I bought his book The House of Sand and Fog and got it signed by him. You can read my take on his opening note here. My friends each did fantastic at the conference pitch sessions. They were all asked for their novels by both agents and editors! A huge congratulations to the Scribe Sisters! Best of luck to you all ladies. For the rest of you, be sure to check out the PNWA conference. According to my critique group it was amazing, and according to their results, I'd have to agree! I plan to try and attend it next year. I'd love to meet my critique partners in person! I'm glad you had a great time! Yeah! Congrats to all of you! I was at SCBWI LA this past weekend and it was amazing! Sorry if I've been absent from the blogosphere, but I'll be around now. Sounds like you and your fellow Scribe Sisters had a great time! I consider myself very lucky to have met them in person Lydia. So many critique groups never meet. But we actually found each other at a writer's retreat and have been working together ever since! Thanks Lisa! I'm so happy for each of them, they've been working really hard to get to this point. I'm glad to see you back amidst the blogosphere! We did Alissa, thanks! One of these days we're going to have to catch up with you at a conference! Sounds like a fun time! Congrats to Karlene, Jule and Linda on the requests! Everyone looks so good in the pic too BTW. Your Scribe Sisters did awesome! Congratulations to each of them. I looooved The House of Sand and Fog. I didn't realize it took the author that long to finish it. Wow. It really was fun Lindsey! I wish you could have been there! I'll tell the ladies you said congrats they'll be thrilled! They really did Julie! I'm so proud of them. It has taken them a lot of hard work and dedication and it's finally paying off! The House of Sand and Fog was fantastic wasn't it? !